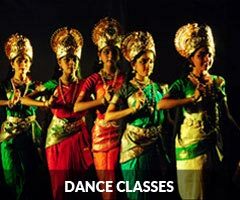 Nrityantharanga | Shree Mookambika Cultural Academy Reg. ‘Nrityantharanga’ is a series of dance performances through which an attempt is made to understand the classical art forms better. It is a journey to the inner substance of the dances, especially Bharathanatyam. It is the dream project of Vidwan B.Deepak Kumar, Director of Sri Mookambika Cultural Academy(R.), Puttur. Vidwan Deepak Kumar had thought creating a platform for young upcoming talents wherein they could showcase their talent and consequently develop the experience of solo stage performance. To put this idea into action ‘Nrityantharanga’ was designed. Here the key idea is to give a platform to the budding artistes to perform solo and through this, training them for facing the audience in future. Another idea is to create a good and well informed Audience or Kala Rasikas for the classical dance. Today the audience is lacking of proper information about the art forms. Hence this platform tries to give a proper and detailed information about the dance numbers performed and also different aspects as per how better to understand the dances performed. The event also provides platform for discussions related to the dances performed so that the audience are confirmed of understanding the Core-Antaranga of Dance-Nritya. Usually any public performances expect huge budget which is not possible for many of the aspiring talents. Keeping this very fact in mind ‘Nrityantharanga’ came into existence with the motto of creating events with minimum cost of expenditure. Mr.Vipin of Darbe, Puttur with a view to support the art, provided a hall ‘Mangalamritha’ without any charges, whom the Academy remembers with full gratitude. The events are done with minimum number of musicians. Sri Mookambika Cultural Academy is arranging this series every month so that the show goes on regularly and a well informed Audience is created in the small town of Puttur.